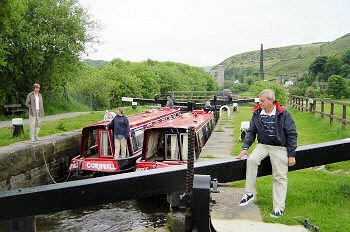 Explore the Rochdale Canal in the Calder Valley, taking in the friendly towns of Hebden Bridge and Todmorden, with stunning Pennine scenery and dramatic walks. Below we show some examples of routes which our customers enjoy. Distances and times shown are for the return trip. You can vary the distance to suit you, because there are plenty of turning points ('winding holes') marked in the guides on your boat. These stopping places are just some among many possibilities. Information we provide about specific waterways or suggested routes is for general reference only. Please see more about route availability. 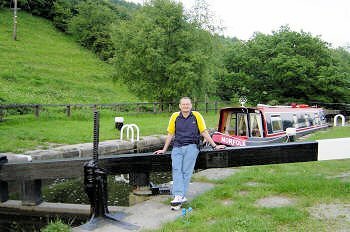 If you choose to come down the last locks on Thursday afternoon rather than Friday morning, you will need to book passage (directions on board). 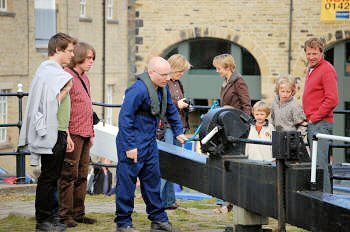 Arrive after lunch in our historic canal basin to take over your boat. 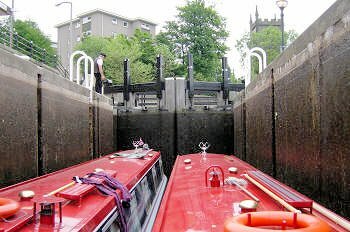 After our detailed briefing, we take you up through the first three locks, including the deepest one in the country. 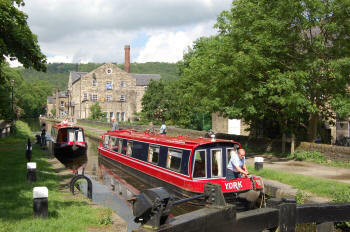 You then sail off along the side of the valley, through two more locks, to Mytholmroyd, where you moor for the night. Here you have two pubs with food, an upmarket café and convenience stores. Next morning travel on to Hebden Bridge. This old mill town nestles in a fork in the hills, houses piled tier upon tier. Hebden is the original plastic-bag-free town, and has not succumbed to a big supermarket, so has an amazing variety of shops, cafes, restaurants and pubs. It's full of surprises - everything from horsey clothing to hand-made pottery, and not one but two bookshops. Keep on through the town and gradually wind up the valley, with woods, crags and the Calder running alongside, and views of the moors high above. Pause at Todmorden, a town schizophrenic as to whether it's Yorkshire or Lancashire, wool or cotton. 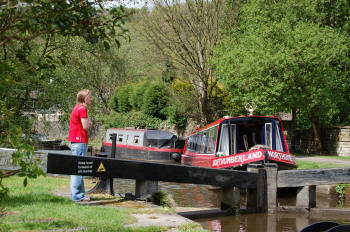 Keep going to Lock 28, moor up and walk along the road to the Border Rose. Keep climbing to Lock 32, after which you can turn. 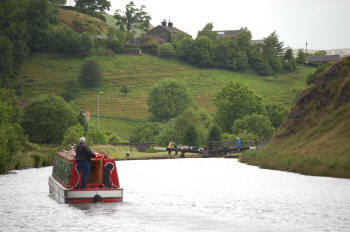 Then make your way back down through to Todmorden, and explore the shops and market. Carry on, to stop for the night at the Stubbing Wharf, our customers' most popular pub. 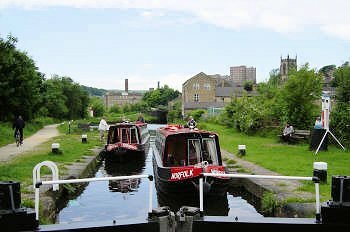 This is a shorter day, to give you time to spend in Hebden Bridge, with its quirky shops, hilly walks and wide array of pubs and restaurants. 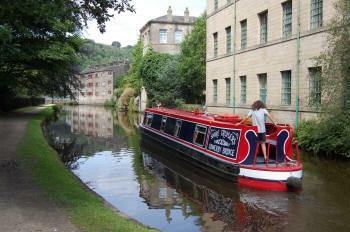 Sowerby Bridge offers a huge choice of places for your last night. You need to be ready for the top lock for 8am, then back to base. This trip gives you time for walks, the pub or simply to sit and unwind. Use this form to check availability. 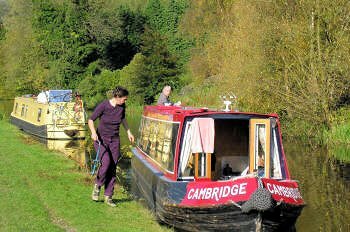 When you find the boat you want, click 'Book this holiday now' and you can pay your deposit or hold for 48 hours - or ring 01422 832712. Look for our latest offers.